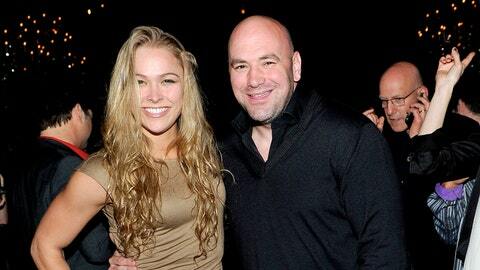 UFC president Dana White (right) said Ronda Rousey's comments about Cris Cyborg were just part of the fight game. BALTIMORE — It doesn’t seem like Ronda Rousey is going to be disciplined for calling Cris Cyborg "an it." UFC president Dana White said in his pre-UFC 172 media scrum Thursday that he doesn’t believe Rousey’s comments were of a homophobic or transphobic nature and that a reporter who called GLAAD is an "idiot." "She’s not a transgender fighter," White said of Cyborg. "She’s a woman. What Ronda is saying is [Cyborg has] taken so many drugs, she’s probably not a woman anymore. She’s not a transgender fighter. She didn’t have a surgery." Rousey’s full quote to Yahoo! was as follows: "This girl has been on steroids for so long and [has been] injecting herself for so long that she’s not even a woman anymore. She’s an ‘it.’"
Cyborg was busted for steroids in 2009, but has not tested positive since in organizations outside of the UFC. White said it’s the fight business and "people say mean things about each other." 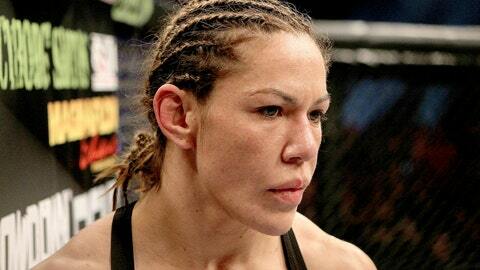 Cris Cyborg was popped for performance-enhancing drugs in 2011. Rousey’s words, though, caused quite a stir. MMA apparel brand Americana even offered $5,000 to the first fighter to knock Rousey out. Rousey, the UFC women’s bantamweight champion, defends her belt against Alexis Davis at UFC 175 on July 5. "She called [Cyborg] an ‘it,’" White said. "[Cyborg] calls Ronda a chicken. Is Ronda a chicken? Should Ronda be offended by being called a chicken? Grow the f*** up, everybody." White admitted to talking trash about Cyborg in the past himself. "I said when I saw her at the MMA Awards, she looked like Wanderlei Silva in a dress and heels," White said. "And she did. Did she not? Who wants to dispute that she didn’t look like Wanderlei? [She was] jacked up on steroids beyond belief and looked like Wanderlei Silva." The UFC did at one point try to obtain Cyborg’s contract after parent company Zuffa bought Strikeforce, where Cyborg (and Rousey) were fighting at the time. But White said it’s "not worth it in the big picture" to sign her right now, even for a megafight with Rousey, because of Cyborg’s past history with performance-enhancing drugs and potential issues in cutting to Rousey’s 135-pound weight class. "She’s a nightmare in every way shape and form to bring in as a professional athlete in an organization like this," White said. However, he did leave the door open a crack. "I’m not saying it could never be done," White said. Notes: White said Anthony Johnson will be cut by the UFC and never allowed back if he misses weight Friday. Johnson was released by the organization once already for the indiscretion. … The UFC does not have a uniform deal with Under Armour, White said, but Under Armour CEO Kevin Plank might be at Baltimore Arena to watch the fights Saturday night. … White will speak at the ground breaking of a new 20,000-seat arena being built by MGM in Las Vegas on May 1.